Mars reaches opposition (appears 180 degrees from the Sun) as seen from the Earth about every 26 months. The apparent diameter of Mars at opposition varies considerably because of Mars' elliptical orbit; at an aphelic opposition, Mars' apparent diameter may be less than 14 arcseconds, while at a perihelic opposition it may be greater than 25 arcseconds. In 2003 Mars reached opposition on August 27 (Universal Time), only one day before perihelion, resulting in its closest approach to Earth in nearly 60,000 years. When this image was taken, Mars was only ten days from opposition, and was 24.67 arcseconds in diameter, close to its opposition diameter of 25.11 arcseconds. In this image the South Polar Cap is at the top, with the bluish North Polar Hood, created by water and carbon dioxide ice clouds, at the bottom. 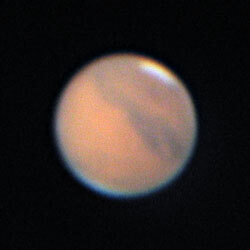 The dark band on the Martian disk consists of (from upper left to lower right) Mare Sirenum, Mare Cimmerium, and Mare Tyrrhenum. Technical Notes: 33 exposures were combined in RegiStax 2.0. The resulting image was then color balanced using Levels in Photoshop 7.0 and sharpened using Unsharp Mask at 100% with a radius of 8.0 pixels and a threshold of 0. The image was then cropped and reduced in size by 50%.